* Update: Edmonton Labour in late February 2015 chose national executive committee member Kate Osamor as its parliamentary candidate. PARLIAMENT MAY soon have a Turkish-speaking member, a Northeast London businessman who helps to organise the British Kebab Awards. Ibrahim Dogus wants to be Labour candidate for the seat of Edmonton, which has just been unexpectedly vacated by Labour veteran Andy Love. Love’s majority in the last general election was 9,613. In that 2010 poll the number of Muslim MPs rose to eight. The prospect of a campaigner from a constituency that is said to be home to the largest number of Turkish-speakers in the UK is exciting them. 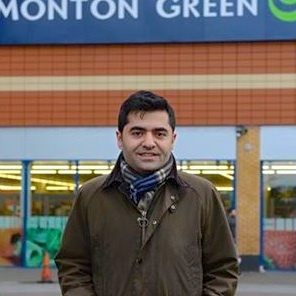 Londra Gazete commented that Dogus’s attempt to win selection for a seat with a Labour majority of almost 10,000 had “electrified party activists and members of London’s Turkish-speaking communities”. An earlier attempt by Dogus, who is founder-director of the Centre for Turkey Studies, to win his party’s nomination for the neighbouring seat of Enfield Southgate failed. Dogus’s potential rivals have not all shown their hands. Yet another former Hackney councillor wants to be an MP – Luke Akehurst also has his eye on Edmonton. So does a failed candidate for the European Parliament, Ivana Bartoletti. The Conservative Party has already named its candidate, a Turkish-speaker, campaigner Gonul Daniels and the Green Party has chosen Douglas Coker, described by his party as a “long-standing activist”. * Main picture: somewhere in this view of Northeast London is Edmonton, or at least some of it.